Me and My Thoughts: Imaginisce monthly challenge & Giveaway! Imaginisce monthly challenge & Giveaway! I can't believe that April has passed by us already!! My kids will be done school soon! Where has the time gone by? Well, a new month always bring new challenges. And Imaginisce has a new one for you yet again. I had read many comments lately and heard many people asking for masculine/boy themed ideas. So Michelle & I came up with this month's challenge and we hope that you enjoy it. 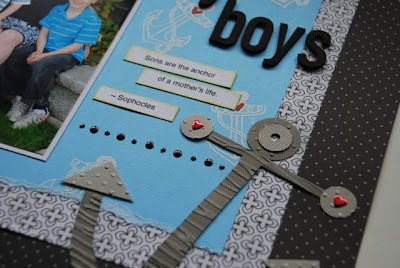 Create a masculine theme layout/card/project and use one of the Snag 'Em stamps on your project. I know many people forget about those darling little stamps that come with each collection so we wanted to challenge you to use those. Here's my layout that I created. 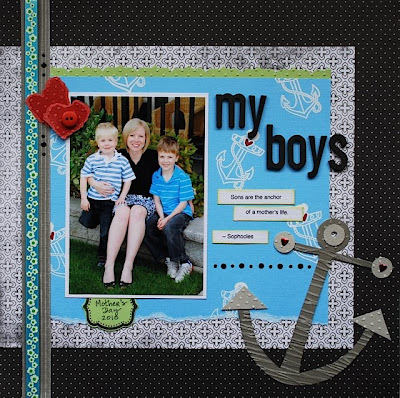 I used the anchor stamp from the Splash Dance collection. 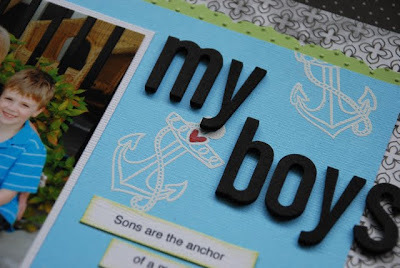 I stamped the image on cardstock with Versamark and then embossed the image with white embossing powder. I colored in the heart shape with a red marker. I also used one of the frame design stamps from Garden Party to write the date in. I added some Glam Rocks here & there on my layout. The large anchor I hand drew and cut out myself. You'll also notice that I didn't use the typical "boyish" papers on my layout. I actually used papers from a wedding collection - To Love & Cherish. 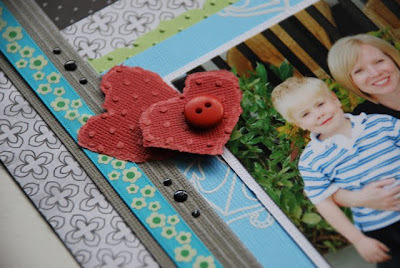 I also mixed in a strip of patterned paper from Garden Party for added color. Make sure to stop by the Imaginisce blog to check out what the Design Team has created. Plus there's always a prize for leaving a comment on the blog today and another one for doing the challenge! I LOVE this layout, Cari! LOVE, LOVE, LOVE it!!! Having two boys in my house, the sentiment brought a lump to my throat :(. **sigh** love those boys of mine! !